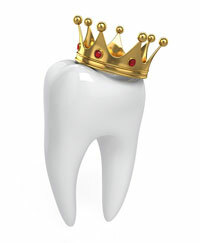 Dental Crowns and Bridges - Lafayette & San Leandro, CA Dentist - Dr. Fatima Beheshti, D.D.S. Dental Bridges are sometimes referred to as fixed partial dentures, because they are semi-permanent and are bonded to existing teeth or implants. There are several types of fixed dental bridges (cannot be removed), including conventional fixed bridges, cantilever bridges and resin-bonded bridges. Unlike a removable bridge, which you can take out and clean, your dentist can only remove a fixed bridge. .
Porcelain, gold alloys or combinations of materials are usually used to make dental bridge appliances. For more information on Dental Crowns and Bridges in either the San Leandro or San Leandro, CA call Dr. Fatima Beheshti, D.D.S. at (510) 635-9204 in San Leandro or (925) 299-9919 in Lafayette today!